Uncategories Is the left/progressive vote splitting each other and giving Ford the win? Is the left/progressive vote splitting each other and giving Ford the win? With the Progressive Conservative party of Doug Ford continuing to lead comfortably in the polls (and in the corresponding projections), one topic of discussion is how the Liberals and NDP are just splitting each other. After all, the PC is about to win a majority with only 40% of the vote. Is that true? In this post, I'm not going to argue about whether the OLP and NDP are similar or have similar policies. I'll simply say this: polls have shown that these two parties do seem to share some of the same voters. The point of this post is more straightforward: would Ford and the PC really lose if the OLP and NDP were together? Are these two parties really splitting the vote? In order to answer this question, I'm using the second choices from the Mainstreet and Innovative polls. Surprisingly, they show very similar second choices. They both agree that the main choice of Liberal voters is the NDP (at around 50%) while the OLP is the main second choice of the NDP voters (at around 40%). Interestingly (but not used in the calculations for this post), the NDP is also the main second choice of PC voters. See the full details at the end of this post. At first, it seems that the people talking about vote splitting are right: there are currently 53 ridings where the Tories are projected to win but the total of OLP+NDP is greater. That would leave Ford with fewer than 30 seats and far away from the job of Premier (instead of the 79 seats in the most recent projections). The mistake, however, is to assume to 100% of the Liberals votes would agree to vote NDP (and vice versa). In reality, some Liberals would rather vote PC or not vote at all. Same for the NDP voters. This is a crucial distinction to remember. Just because two parties share some of the same voters doesn't mean all these voters would be okay voting for the other one. 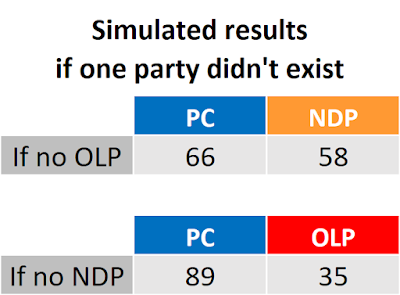 I therefore used the second choices to redistribute the votes in two scenarios: one where the OLP wouldn't exist and one where the NDP wouldn't. The table below shows the results. As you can see, if the OLP was to disappear and "merge" with the NDP, this would lead to a very competitive rate but the PC would still win (a short majority, which is logical with only two parties winning seats). On the other hand, if the NDP was to withdraw, the Liberals would pick up enough voters to only win 35 seats. The main reason why the Liberals would perform much worse alone than the NDP would is because the share of NDP voters willing to vote Liberals (as 2nd choice) is smaller than the share of Liberals voters having the NDP as 2nd choice. In both cases, Doug Ford would still win. And keep in mind these two scenarios are already optimistic as I'm assuming the remaining party (the NDP when the Liberals wouldn't exist for instance) would retain 100% of its votes. So, is the left splitting each other and giving Ford the win? The short answer is currently no. The Conservatives are winning because they are by far the main party at 40%. NDP and OLP are splitting each other partially but this isn't the reason why Ford might end up Premier next month. After, there is no denying the electoral system is playing a role here. With a proportional system, Ford wouldn't be able to win a majority. But that's another discussion. By the way, here is the average second choices used in these calculations. As a side note, the fact that about 30% of PC voters have the NDP as second choice could be a source of great swings in the next few weeks. It's not unreasonable to think some of these voters are currently voting PC just because this party is seen as the main option to defeat the Liberals. I talked about this here.